This is one of "muss have" sambal in all Padang restaurants. Good to accompany Nasi Padang which usually combined from white rice, Rendang and Cassava Leaves Curry . 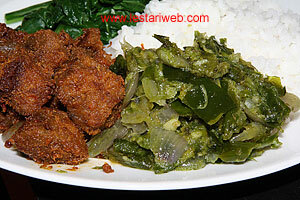 Then top up with lot of Sambal Lado Ijo ..hmmmmm it's completely Minangkabau delicacy, which I can not resist ;-). So if you're keen of spicy dishes, then Minangkabau's or well known as Padang's food is the right choice !! Sambal Lado Ijo is a fairly spicy relish, not so spicy as you imagine because green chili is unriped chili, hasn't achieved the hottest stage!! 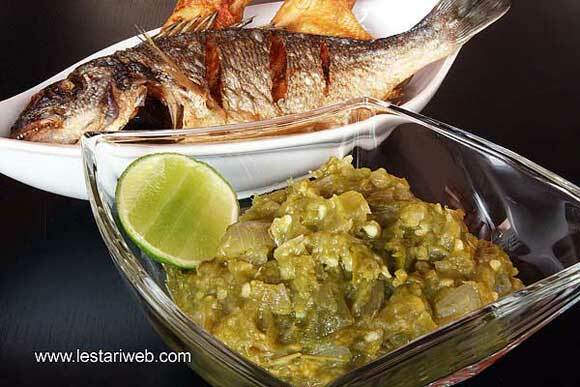 You can also serve this sambal to accompany fried side dishes such as deep-fry fish, fried chicken etc. It's simple relish but taste really delicious!!!! Tipp : Make it a little bit salty to obtain its best taste!! 2 Transfer all the steamed ingredients on to grinding stone (or mortar & pestle) and grind coarsely. 3 Heat 3 tbsp oil in a wok or saucepan. Add grinded sambal, stir-fry over medium heat until fragrant and oil begins to appear on the surface, take about 10 mins. Stir occasionally. 4 Add grinded sambal, stir-fry over medium heat until fragrant and oil begins to appear on the surface, take about 10 mins. Stir occasionally. 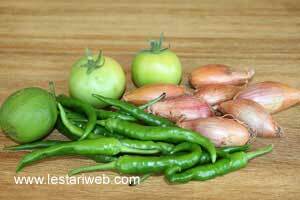 TTipp: You can make a large amount of sambal, let sambal cool completely then store it in an air-tight jar & keep in a fridge. Sambal will stay good for 2 weeks.